Should blockers expand into terrain? The idea is to make blocking army paths easier. I would like to ask the players would they like blockers to expand into terrain? If not could you please explain what would be the reason you dislike the idea? First discussion we had I thought if you use the premium account scout terrain option you would be able to find a good place. Thing is even when you use the option, you can not be sure if it would block, because as we all know its sometimes possible to walk over a forest or very close to river, where city can not expand. What some of players suggested - why should it be a problem to order your builders to build a blocker? Its not rocket science, you just build walls to block the passage. 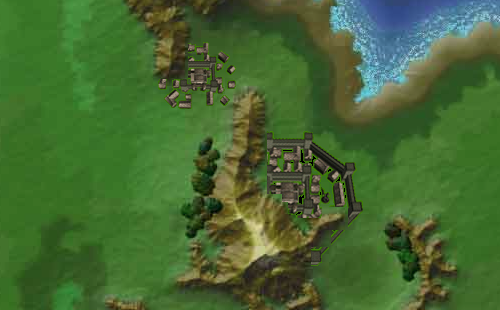 I suggest making the extra buildings into terrain to cost much higher, so people would not use it except when you want to make sure it would block. So please let me know what are your thoughs? I think its only logical for blockers and terrain to become part of each other. Any engineer in a hostile world would incorperate geographic natural defences into their city layout, be it water, mountains etc. within reason so if it was a 40k block area maybe you could build 57.6k size into blocker?? and so on so forth with all, so 14k block area would be fine youd have to be n00b to mess that up but anything higher than 40k maybe a good idea for it. I like it. But wouldn't it change up strategies for dwarf and elf players? Like say I wanna build a 90k as an elf but only get to city size 2 to reduce cost of building etc.. Question here is does anyone consider walking around a blocker that does not block as tactical move? Or could that be considered a game bug? Its a widely abused bug. It is clearly a bug. It is too difficult to place a blocker, and it should not be. "If it doesn't block, is it a blocker?"